Reading and comparing reviews is a great and efficient way to learn about peoples opinions and experiences in a very short time. Reviews can be of great help when you have to make small or major decisions, need to purchase a product or want to book an event. The web is therefore the perfect source to showcase or write reviews and read and compare them with only a few clicks. It has become quite popular to have ratings for all kinds of things, e.g. commercial products like books and fashion or web content like videos and articles. From cars to movies, gadgets or hotels, people love to read reviews and ratings to inform themselves about a certain topic, but they also like to write reviews to share their opinions and experiences on latest trends, movies, trips or hotels. If you would like to create a WordPress website to showcase or write reviews about certain topics or products, then please see our collection of WordPress review themes. We have selected some of the most popular review themes for WordPress which all either have a professional review system integrated or which are compatible with popular review plugins for WordPress. Starting with NewsCode in our WordPress review themes collection, as it is a powerful WordPress review theme with an appealing and fresh design. You can use NewsCode to set up vivid online magazines, news websites or personal blogs to present reviews about all kinds of different topics. To push your ad revenue, NewsCode also lets you display background advertisements in a pleasant way. You may also customize this review WordPress theme with your own logo and header image. Margot is a colorful review WordPress theme with a unique and beautiful design as you can assign different colors to your categories. This review WordPress theme comes with an integrated and flexible review system to showcase ratings nicely. And moreover this theme offers several great features like different post formats, layout options and more to customize your site accordingly. Car News especially has been designed and developed to create cool and modern review websites about cars, motorcycles and other vehicles. You can showcase reviews in a dynamic and pleasant way and inform your audience about latest trends from the automobile and vehicle industrie. As Car News is compatible with the popular WooCommerce plugin it also allows you to integrate an online shop to sell merchandise or other stuff on your WordPress website. Reviewer covers the entertainment segment in this review WordPress themes collection as this theme is perfectly suitable for websites about TV shows, movies, cinema, gaming, videos or anything else related to fun and entertainment. The Reviewer WordPress theme is very customizable to fit your needs and requirements, you may thus select from different background patterns, layout options, colors for rating elements and more to customize your website accordingly. BUCKET is a classic magazine WordPress theme with integrated review functionality. It is therefore the perfect solution for editorial related websites like lifestyle magazines or dynamic news websites. Using BUCKET you can showcase reviews of interesting articles, viral videos or commercial products. You may also tweak this review WordPress theme using the custom page builder and make use of a fancy mega menu on your editorial WordPress website. Are you a huge movie, serial or daily soap fan and plan to launch a review website to share your opinion with the community? Then Movie Reviews is worth a look as this WordPress theme offers an integrated review system to showcase reviews in a cool and appealing way. Movie Reviews lets you embed videos with ease and display additional content using the several included custom widgets. Using SpotLight you have most flexibility when it comes to tweaking your website. SpotLight is a highly-customizable review WordPress theme which is ideal for online magazines, news websites or other editorial websites. It offers a classic, yet modern design which is perfect to display content in an appealing manner and encourages website visitors to leave reviews and ratings on your site. RoProfit is a simple review and affiliate business WordPress theme which allows website visitors to review and rate products or other content on your website. With RoProfit you can manage a modern online business where you can showcase reviewed items and earn some affiliate commission through referrals when someone decides to purchase a product through your affiliate link. In case you are looking for a fancy review WordPress theme which is suitable for lifestyle, fashion or beauty websites, then Minimosity is a great catch within this review WordPress themes collection. Minimosity offers a fully responsive layout and retina support for pixel sharp images. Using this minimalistic, yet beautiful review WordPress theme, you can present latest fashion, cosmetics or beauty trends and showcase reviews in a pleasant way. To give your website a fancy and modern look, you can select from unlimited skins and customize your site accordingly. 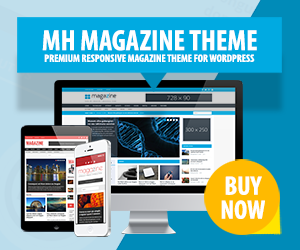 Magazine review WordPress theme comes with a pure design and a fully responsive layout. This review WordPress theme can be used to create dynamic online magazines or editorial websites about art, design, traveling, nature, photography or any other topic. Magazine further offers a unique box slider which lets you showcase latest articles in a prominent and eye-catching way. Entrance is a clean and minimalistic review WordPress theme for magazine, editorial, photography and news websites. This WordPress review theme offers a fully responsive layout and is retina ready to display images pixel sharp on high resolution devices. Thanks to the theme customizer, you can modify Entrance in various different ways and change the color scheme, logo or background. Do you like our WordPress Review Themes Collection? We’re always excited to receive feedback about our WordPress themes collections. So how do you like this WordPress review themes collection? Have you ever used one of these WordPress themes and what is your experience or opinion about these themes? And can you recommend other WordPress templates for review websites as well? Feel free to leave us a comment.